Dropbox will “price” its Initial Public Offering – IPO for short – on Thursday and begin trading Friday if all goes according to plan. Reports are that the offering is “oversubscribed” – a Wall Street-speak term meaning that they’re hard to get – and that there’s a lot of “demand” for shares. So why is it you shouldn’t touch ’em with a ten-foot pole? Because Dropbox is going to be another company in a long line of “oversubscribed,” in “demand” public offerings that isn’t worth the paper its stock certificates are printed on. Newly minted tech companies are a dime a dozen. As such, they have no place in an investor’s portfolio until after they’ve proven themselves with a quarter or two of numbers as a public company. The numbers look impressive at first glance. Analysts will waste no time telling you, for example, that the worldwide cloud industry is expanding at 21.9% a year and will be worth a staggering $227 billion by 2021, according to the IDC. Just keep in mind that’s no different than the breathless hype from an old-fashioned boardwalk carney hawker 120 years ago trying to lure you into a tent to see the “Lizard Man” or some other oddity. Dropbox is selling 36 million shares with an option to increase that by another 5.4 million if underwriters like The Goldman Sachs Group Inc. (NYSE:GS) and JPMorgan Chase & Co. (NYSE:JPM) exercise their rights to buy more as the stock takes off. Initial prices are expected in the $16 to $18 range which suggests a valuation of up to $7 billion. That, too, sounds great because it would make the Dropbox IPO the biggest since Snap Inc. (NYSE:SNAP) debuted roughly a year ago. The projected $7 billion is $3 billion lower than a 2014 funding round reportedly valuing the company at $10 billion. Ergo, the company is already worth less than insiders thought it was a few years ago. With four years behind them, the number should be going the other way… as in higher. Then there’s the fact that Dropbox’s growth is slowing. Revenues jumped 40% from 2015 to 2016 but only 31% from 2016 to 2017. I think this year the company will come in at 25%, perhaps less, because the vast majority of its roughly 500+ million users don’t pay for the service, yet still enjoy benefits. The company would have to turn in at least 20%+, consistently, year over year to be worth the “risk” in my book, and there’s not a snowball’s chance in you know where that’s gonna happen! Why people think companies like Dropbox are so special is beyond me. The company is one of dozens of outfits offering collaborative applications – a fancy Silicon Valley term meaning stuff that lets you work with others. Besides, Alphabet Inc. (NasdaqGS:GOOGL), Apple Inc. (NasdaqGS:AAPL), Amazon.com Inc. (NasdaqGS:AMZN), and Microsoft Corp. (NasdaqGS:MSFT) all have similar products, not to mention far deeper pockets and, not coincidentally, real businesses kicking off billions of dollars in real revenue. I’m also deeply suspicious of how the company’s shares are structured. Normally you get some sort of shareholder voting rights when you buy stock in a company, but Silicon Valley’s Technorati cannot be bothered with the likes of you and I having a say in their affairs. So, they’re hoping investors won’t notice that the founders and early investors hold 10 voting rights per share with their Class A shares while the hoi-polloi gets just one vote per share via Class B shares. And, finally, just like other “hot” IPOs, the Dropbox IPO is an exit, not an entry for investors hoping to get in on the action. You and your money are literally last in line behind a long line of founders, lawyers, angel investors, venture capitalists, and investment bankers – every one of whom gets a cut of your money and cashes out on your dime once the company goes public. It’s a recurring theme and, sadly, one that greedy, star-struck investors fall for with alarmingly regularity. Every one of these companies had a huge spike followed by a massive drop that carried investors out feet first and cost them billions of dollars. Snap has fallen 45.82% from a post-IPO high of $29.44 per share. FitBit is down 89.81% from a post-IPO high of $51.90 per share. And, last but not least, GoPro has fallen 94.89% from its post-IPO high of $98.47, as I write. Like that’s a surprise, which is why I explicitly warned you against investing in all three! Silicon Valley manipulates the hell out of pre-IPO numbers and it’s one of the dirtiest secrets in modern finance. As you might imagine, this is information they don’t want you to know. Company founders and initial backers start with numbers that are completely cooked up from the get-go. The goal is to make any valuation they come up with seem as high as possible no matter how cooked up or absurd it is. The reason they do that is because that’s how you create the illusion that a company is mature and credible when it comes to attracting desperately needed talent, business partners, and – ta da – more funding. Then, those same folks hold the company private as long as they can to maximize the “value,” while simultaneously creating retail investment “demand.” You really don’t believe all those stories and puff-pieces you see about gee-whiz technology and the brighter-than-Einstein founders who created it are “leaked,” do you?! I didn’t think so. Me neither. Cash flow, believe it or not, is almost irrelevant. It used to be back in the day when I first started and companies went public based actual growth, but not anymore. What matters today is how many users are on board even if they’re not paying a damn thing for the product they’re using. That’s how you “monetize eyeballs” – which is Silicon Valley buzz-speak meaning how you convert users to paying customers. A rational person knows that you cannot spend more money than you make, but spending more capital than you take in is standard operating procedure for almost every company hoping to IPO these days… because otherwise you might be missing out on potential. Damn near every IPO in recent history has had “tailored” numbers intended to make the company in question look more profitable than it is when it’s time to go public. FitBit, for example, didn’t want investors to know that the rash-related recalls significantly and very negatively impacted earnings. Spotify, a music sharing service, is going public in April third and is one of the more extreme examples I’ve seen recently. Management, according to Bloomberg, is trying to convince investors that EBITDA – earnings before interest, taxes, depreciation, and amortization – is a far more valuable “metric” than actual bottom-line performance. That way the company seems like it lost only $400 million for 2017, as opposed to the company’s actual loss of $1.4 billion. In my best Dr. Evil voice… riiiiiiiighhhhht! 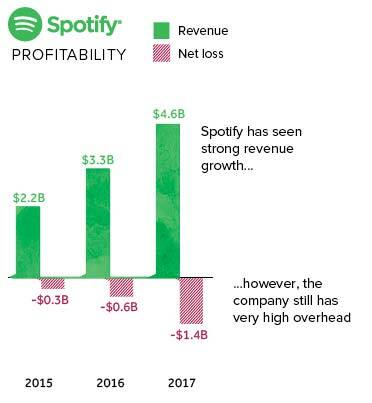 The music industry and streaming, in particular, operates on razor thin margins. There isn’t a streaming service in the world that will make money in the foreseeable future, a comment echoed incidentally by Mark Mulligan, Managing Director at MIDia Research, whose views are consistent with mine. If you really want to see what Dropbox, or any other IPO for that matter, is worth, take a look at the common stock valuation assigned to shares employees hold or which are eligible for equity incentives. Not only is that figure typically far smaller, but it’s got the added advantage of being calculated by accountants who are professionally accountable and liable for accuracy (as opposed to investment bankers, lawyers, and founders who arguably are not and who have every incentive to pull the wool over your eyes). According to a quick review of the Dropbox’s S1 in connection with the IPO, it reveals that roughly 7.4 million shares are being held out as part of the amended 2008 Equity Incentive Plan which reflects a weighted-average exercise price approximately $7.01 – or roughly half the expected IPO pricing. This is what “they” think it’s worth, so why on earth would you pay double… or more??!! To Dropbox’s credit, the company’s IPO filing does warn in plain English that it has a “history of net losses” and sees slowing revenue growth at a time when expenses are increasing. Dropbox “may not be able to achieve or maintain profitability.” You can read that here if you’re game. In closing, IPO’s are like gambling in one of the world’s finest casinos. You might get lucky… but the odds are stacked heavily against you. It’s far more profitable to wait until a company proves itself with a quarter or two of solid numbers. Unless, of course, you’re anxious to give your money to Wall Street traders – all of whom would be more than happy to take it.